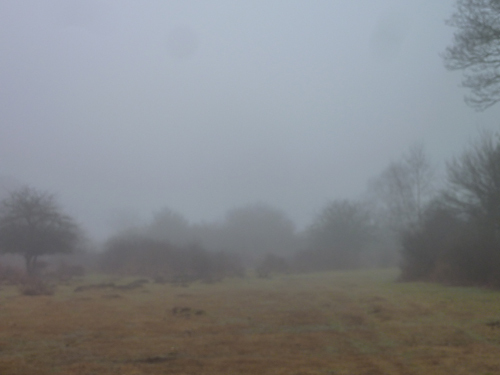 It’s murky, still and silent around Linford Bottom, that thick silence that it seems nothing will penetrate. 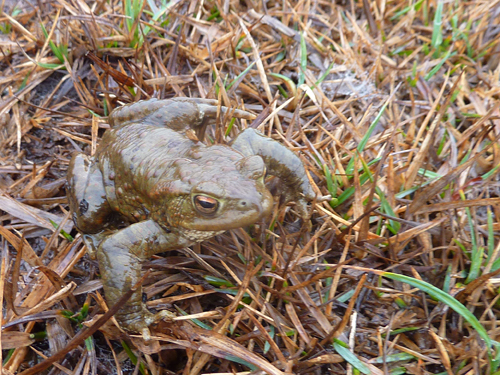 A little frog making the most of the dampness around the bog in Akercome Bottom. 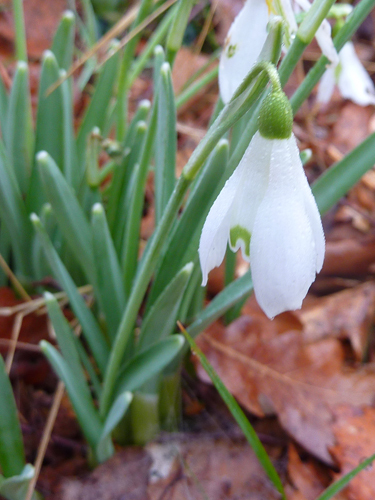 A snowdrop at the edge of the trees. 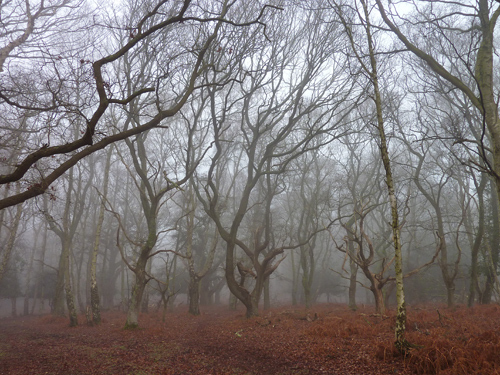 The trees at the top of Pinnick Wood are ghostly shapes appearing out of the mist. The shapes of the winter trees are picked out deep in Pinnick Wood. 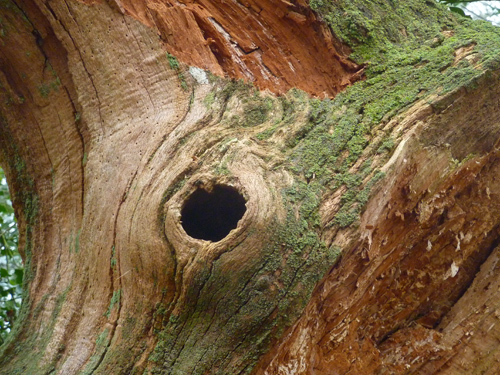 A hole in a tree looks a perfect place for a nesting site. I wonder who lives in a hole like this? 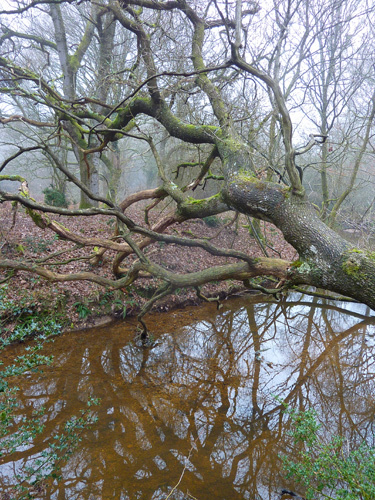 Even Linford Brook has reflections on this still morning. 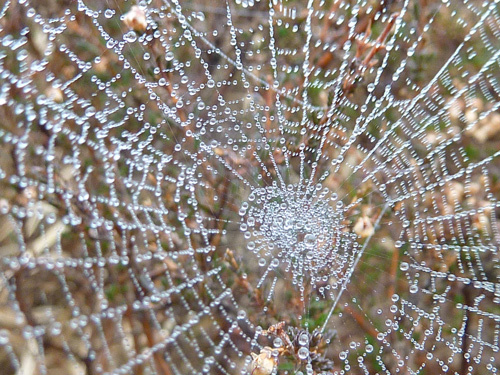 Dew drops on a spiders web – natures diamonds. 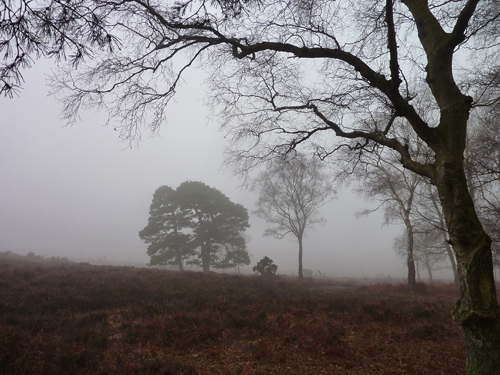 Back down in Linford Bottom, the mist lingers on. 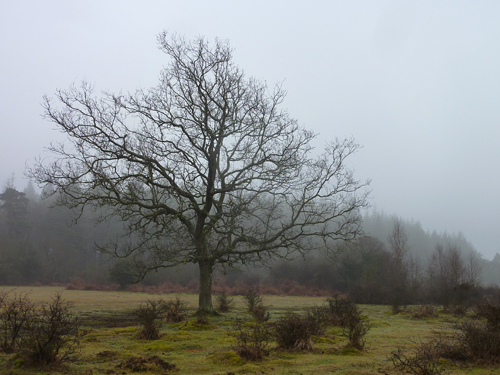 The mist has lingered all day and comes and goes as we head up onto Ibsley Common in the afternoon. 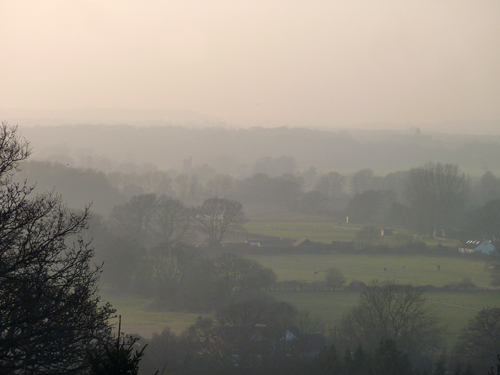 As murky over the village of Ibsley and looking into Dorset as it was this morning. 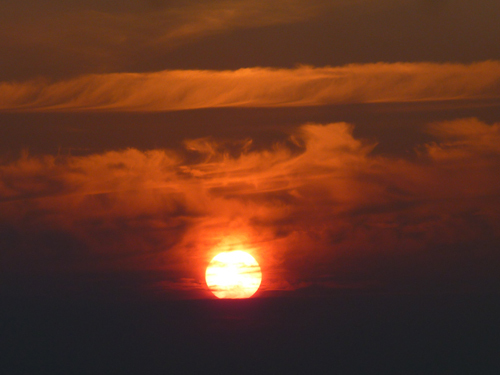 The landscape disappearing into ever paler shades of greys, peaches and pinks. Robin Hood’s Clump in black and white. I’ve mentioned before that underneath this clump of trees is a bronze age disc barrow cemetary. 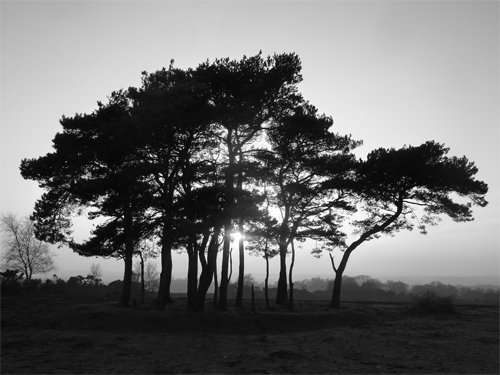 However, I discovered recently that the trees were planted by Lord Normanton in 1931, replacing those that were destroyed by a heath fire. The originals were planted by the 2nd Lord Normanton in about 1850 in addition to those at Whitefield Plantation and on Dorridge Hill nearby. The plantations would be an important part of the skyline when viewed from the Normanton’s estate of Somerley on the other side of the valley. 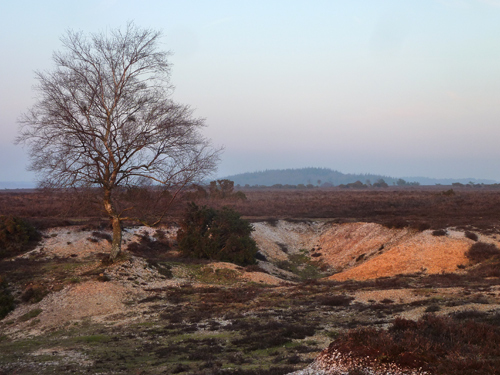 North Hollow Gravel Pit – one of the old pits from which New Forest Commoners exercised their rights to take sand and gravel from the common land. The woodland in the background is Hasley Inclosure. 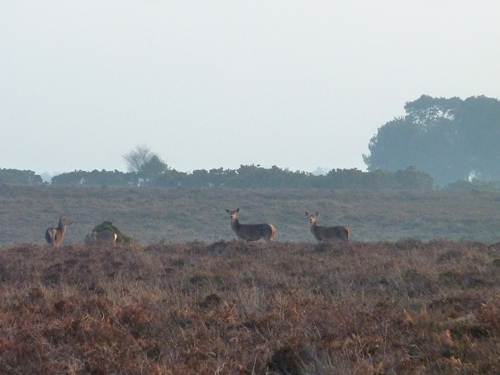 The local red deer seen in front of Whitefield Plantation. The heather clad slopes and ridges of Ibsley Common. The expanse of Chibden Bottom. 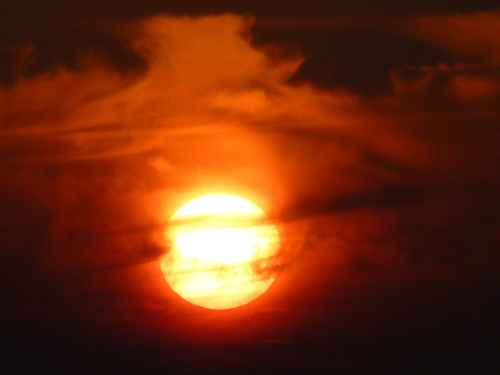 The sinking sun setting the clouds on fire. 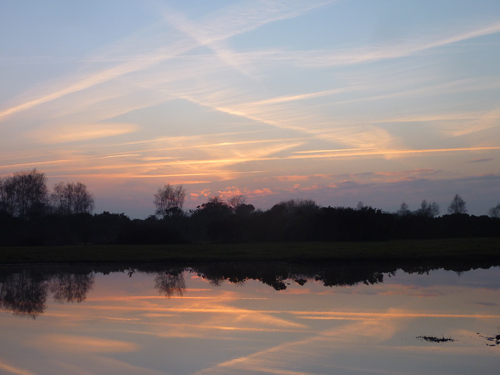 The sun has set leaving the criss cross cirrus clouds reflected in the still water of Ibsley Pond. 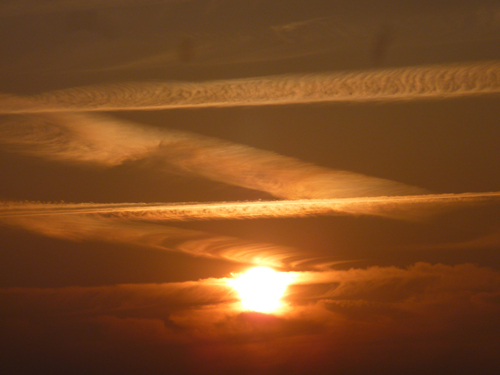 This is a view I never get tired of photographing, it’s always different.